The catastrophic Baige landslide occurred at 22:05:36 (Beijing time, UTC+8) on the 10th of October 2018 in Tibet, China. The large and rapid landslide generated strong long-period seismic signals that were recorded by broadband seismic stations. In this study, we inverted the long-period seismic data from five broadband seismic stations at distances of 108 to 255 km from the event to obtain a time series of forces that the landslide exerted on the Earth. Then, we calculated the spectrogram of the vertical component of the seismic signal generated by the event, recorded at the closest broadband seismic station (GZI). This spectrogram, combined with the force-time function and the field investigation, described the dynamic process of the landslide that could be divided into three intervals. For the first interval, assuming that the rockslide can be regarded as a sliding block, we estimated the average slope-parallel acceleration of the sliding materials at 1.08 m/s2, and the average friction coefficient at the base of the rockslide at 0.47. In the second and third intervals, the rockslide had converted to granular debris. The direction and timing of the force correspond to the different points in the sliding path of the granular debris. We used this correlation to estimate the speeds of the granular debris. 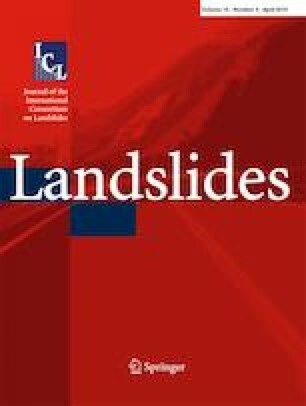 This study demonstrates that the seismic signal generated by the landslide provides an effective method for estimating the dynamic properties of the landslide. Waveform data for this study air provided by Data Management Centre of China National Seismic Network at Institute of Geophysics, China Earthquake Administration. This work was supported by the Major Program of the National Natural Science Foundation of China (Grant No. 41790433), the NSFC-ICIMOD Collaborative Project (Grant No. 41661144041), and Key Research and Development Projects of Sichuan Province (2017SZ0041).